It was hot in NYC last week. Record breaking hot. It was 97 degrees with 1000% humidity so it felt well over 100 degrees. This is the kind of weather we expect occasionally in August but not in June. When this weather hits we tend to stay indoors. But I decided to embrace the heat on Thursday. By now you know how much I love New Orleans and 100 degrees with full humidity is what they call a cool summer day down there. So jumped on the L to Williamsburg to get my NOLA on. First stop, a return trip to Juniper. 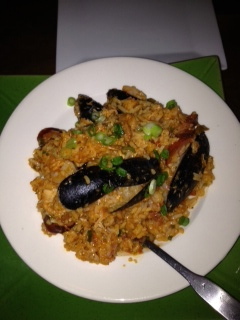 Juniper is the great Cajun restaurant I wrote about recently. What could be better on a hot summer night than eating great cajun food? I was hoping they still had their Jambalaya on the menu. They did. With a belly full of jambalaya I was ready for the main event. 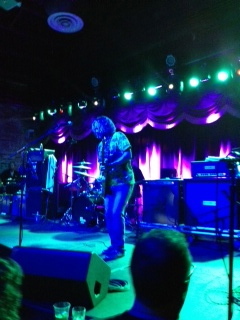 Anders Osborne at Brooklyn Bowl. Brooklyn Bowl is modeled after the legendary Rock 'N' Bowl in New Orleans. It is a great, massive space with a carnival like atmosphere. The main room is a big space with a nice stage for shows. The full bar is stocked with a nice selection of Brooklyn and local beers. Blue Ribbon does the food, delivering top notch versions of classic comfort food (fried chicken) and cajun food (oyster po' boys). And yes, there is a full bowling alley. There are those who grumble that it is not a great place to see shows but I love the place. The Alabama Shakes show I saw there was their best, so much for it not being a great live venue. The draw for me on Thursday was Anders Osborne. Anders was born in Sweden and moved to New Orleans over twenty years ago. He has fully immersed himself in the music and culture of his adopted hometown and with his distinct voice, blistering guitar playing and strong songwriting Anders has become one of the leading artists in that town. Blues, rock and heavy doses of swamp are the signatures of his sound. His 2010 release American Patchwork was my record of the year and his newest record, Black Eye Galaxy, is a strong follow up. Anders Osborne has also become one of the best live acts in a town full of them and his show at Brooklyn Bowl on Thursday was no exception. I have seen Anders a lot and I can say he has become one of the most constantly strong performers there is. His new album, Black Eye Galaxy, is one of his heaviest to date and his set on Thursday followed suit. Backed by a crack band Anders played a tremendous 2 1/2 hour set. He was eventually joined by another guitarist, keys, sax and harmonica and performed songs from the new album, his catalog and some choice covers. It was the kind of set you see on a nightly basis in New Orleans but rarely here. To watch an artist stretching out, jamming, playing, joined by friends and going as long as the crowd wants is all you can ask for and one of the great pleasures in life. By the time I hobbled out of Brooklyn Bowl on Thursday I was exhausted and soaked, my legs ached and I was completely happy. It felt like another great night in New Orleans, except that I got to take the L train home and sleep in my own bed. It doesn't get much better than that. Hello guys this is really a nice post i love to see this here on just single click on our homepage playfreecellonline.net you will play the most amazing and fantastic freecell game this is the multiplayer card game which you love to play online on your pc tablet and smartphone this is really an amazing and popular game here you have to score more to get more points. The Kerala State Education Board is the most reputed Board of Education in India. The primary duty of the board is to prepare the syllabus for schools affiliated with this board. Safety of the data is one of the most important things which every one of us inevitably needs to have an especially that which is related to the email accounts. Welcome to the Official website of Lucky Patcher by ChelpuS. Download Lucky Patcher apk latest version for your Android now. Well, considering the sheer number of RC car models available in the market, there definitely a bunch of affordable models that compete fairly with their more expensive counterparts. As RC car fans, we know that it can be difficult to find a good one when you have a decided budget in mind. When it comes to live streaming of movies on your phone, nothing beats Showbox. ... Showbox servers tend to remain down at times, which makes movie streaming quite difficult with the app. ... Best Apps Like Showbox for Android and iOS to Stream/Download HD Movies for Free. The Automatic Call Recorder is one of the most popular call recording apps among Android users. The app has the ability to record class from any number, no matter if it is local STD or international. Moviebox is one of the most popular on-demand video watching apps in the world for all the movie-fanatics out there. It is one application which is compatible with all Operating Systems, whether your smartphone runs on iOS, Android, Mac, or Windows. KingRoot is one of the best yet reliable app to root your Android phone. 192.168.1.1 is one of the common DNS Server IP addresses which the routers use as an access point. Quit 9 to 5 Academy is an efficient and helpful A-to-Z program that is designed to mentor entrepreneurs to manage their affiliate marketing campaigns and using the paid traffic effectively. The trainees of this program would learn the methods about producing effective earnings and revenues from their digital items promotion campaigns with the sole aim of altering the traditional daily wages. Firstly, you need to check whether the IP 192.168.1.254 of your router has been typed properly or not. The Quit 9 to 5 academy is the exact partner to help you understand all the alphabets of the current digital marketing industry and its trend. The Quit 9 to 5 Academy review is exactly designed to help you know all there is to this academy which aims to educate you about digital marketing. Showbox is one the best app to watch your favorite movies & TV shows. Stream any video or download movies & TV Shows for free.